The Beast is Nyack, New York’s visionary new gallery space for exciting, fresh & unique art of any & many kinds. 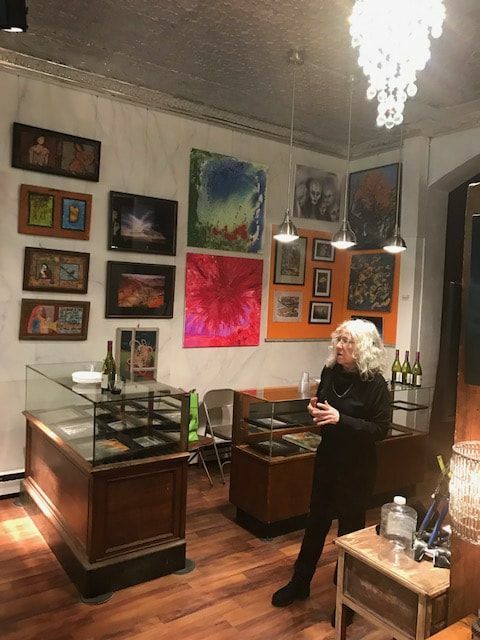 With a special focus on the deep pool of talent in the Lower Hudson Valley, proprietor & well-known Rockland County fantasy artist Lex Reibestein is your friendly guide to all the best art the area has to offer. The Beast with a Million Eyes was located at 70 South Broadway, Nyack, NY 10960. This ​location is currently CLOSED while we look for a new space. ​See our "Contact" and "Events" pages for details on current Beast activities. The Beast is home to various events. Along with solo & group Themed Shows, and pop-ups, we present Readings (of various types), Musical Performances, Films & Creative Salons. All are part of the Beast atmosphere. Openings generally kick off with an Open House event, including live music, food, wine & cheese and of course lively interaction among the participants. To learn more about our current and coming events see our Events/Pop-ups page or get on our mailing list. Please drop us a line if you have any questions. The Beast is always looking to partner with local (and non-local) Artists (including but not limited to Painters, Sculptors, Printmakers, Photographers, Craftspeople) of all stripes (& even polka-dots) to give them a platform from which to present their work. 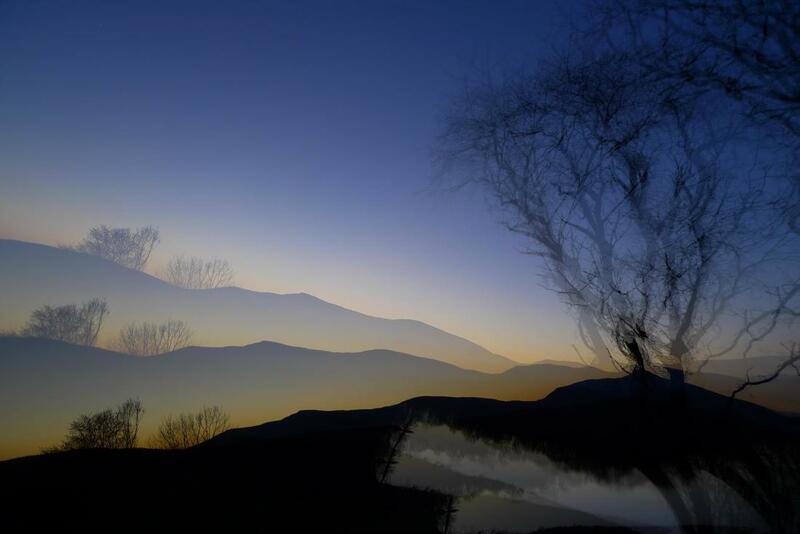 We are especially open to emerging artists, outsiders and forgotten masters. 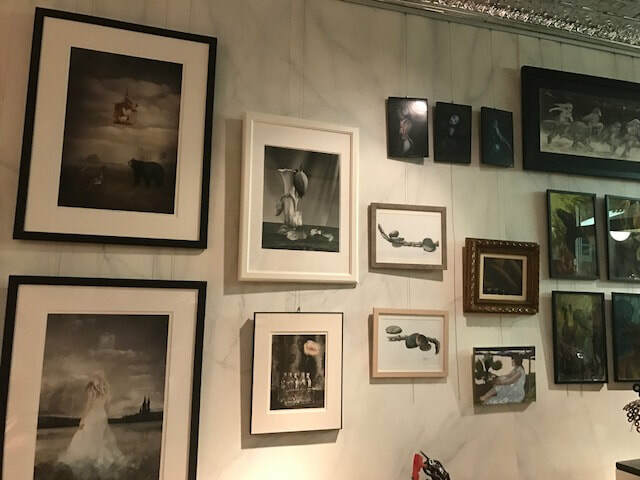 A Selection of Works from our Grand Re-Opening Reunion Celebration, April 2017. Artists include: Elisabeth LADWIG; Leslie HANES; Jacqeline MAHAN; Grover CHAPMAN; Dan WHITE; Paige BLINN, Michael VILLAROSA. ; Drew MERLO. RIGHT: Central Scrutiizer Leslie POWELL admires Work by Kerrie Lee GREEN; Ken SMITH; The Beast & Morgan ZELMER; Arabela WILSON; Caroline ZEGART; Joseph KEPPLER; Mark PATNODE; Amelia AUMAN; Joseph PERONI. 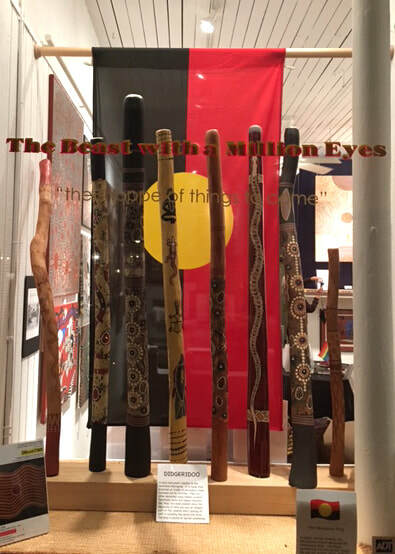 Authentic DIDGERIDOOS in our 1st DREAMTIME Exhibition of Contemporary Australian Aboriginal Art, Nov 2016, original location, 68 S. B'way, Nyack NY. The BEAST himself (center) attends an exhibit of fine caricatures by Dan SPRINGER (coming August 2018 to the Beast! ), escorted by the wonderful artist/photographer Artemisia (left); also in attendance (center): Beast vet Dan WHITE (left) & Vinnie RAFFA. Snapped at Jos. CAPASSO's ROSE Gallery, Franklin St. - a fellow Member of the Nyack Art Gallery Owners Assoc'n. 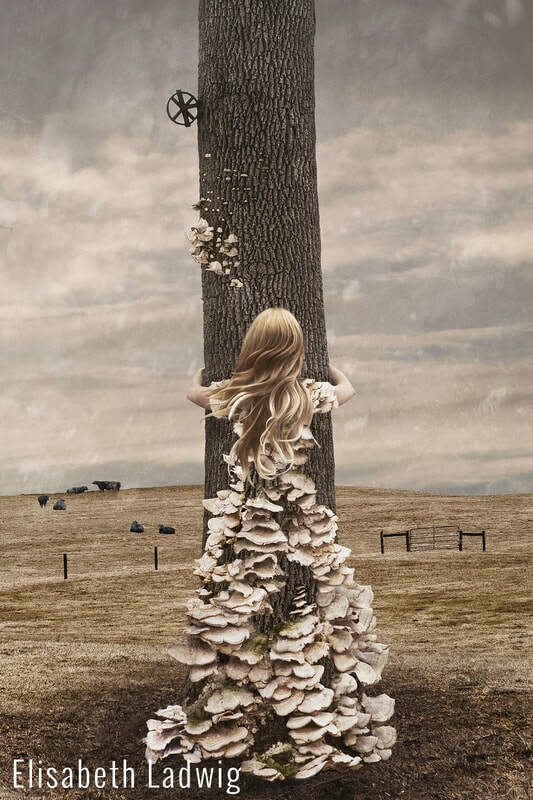 Art is Magic! Share the dream.